Bring dawn all ingredients(7) and reach 70000 points to complete the level. This is again hard level with ingredients requirement with 65 candy board and it wont be easy to take then down within 30 moves. 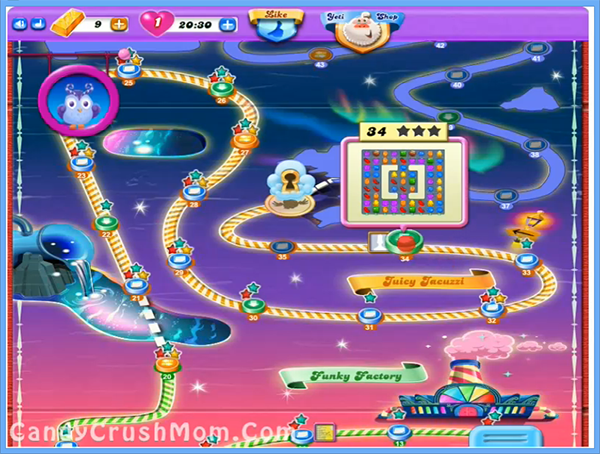 To complete this level you need to break candies that are below ingredients or need special candies. You should try to make colorbomb that you can get by combining five same color candies or try to struck moon so you will have more chance to make colorbomb and try to combine it with striped candy that you can get by combining four same color candies. You shouldn’t forget to balance the Odus owl and try to use more special moves. We completed this level with 94500 score by using more special candies and try to struck moon by breaking candies that The owl have.